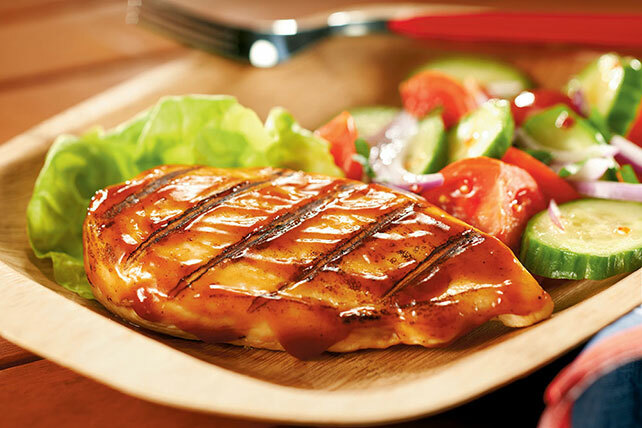 Say buh-bye to dry and hello to moist, flavorful chicken breasts. What makes them perfect every time, whether grilled or baked? Gotta be the BBQ marinade. Pour dressing over chicken in resealable plastic bag; seal bag. Refrigerate 30 min. to marinate. Remove chicken from marinade; discard bag and marinade. Heat grill to medium heat. Place chicken on grill. Grill 12 to 15 min. or until done (165°F), turning and brushing occasionally with barbecue sauce. Marinate chicken in glass dish instead of plastic bag. If chicken breasts are thick at one end, flatten thick end of chicken to ensure even cooking. Don't know what to do if your grill runs out of gas unexpectedly or if it starts to rain? Just place the chicken on a baking sheet and bake at 400°F for 20 min. or until done.